Appearance Day of Advaitacharya ~ The Toronto Hare Krishna Temple! Toronto's Hare Krishna Centre (ISKCON Toronto), has always been the hub of a rich, vibrant and enthusiastic community. Whether it be grand festivals, programs at local universities and yoga studios, philosophical discussions, cooking sessions, or singing and dancing on the streets, there are events taking place for everyone's interest. Wednesday, February 5th marks the appearance anniversary of Advaitacharya, one of the foremost teachers of bhakti in the Hare Krishna tradition. On this day we fast till noon in his honour. Advaitacharya appeared some sixty years before Lord Chaitanya’s own advent, over 500 years ago. It was Advaitacarya who asked Lord Chaitanya to descend. Before Lord Chaitanya’s advent, Advaitacharya had already begun chanting Krishna’s names in the streets with devotees and discussing scriptures on devotional service to Krishna. 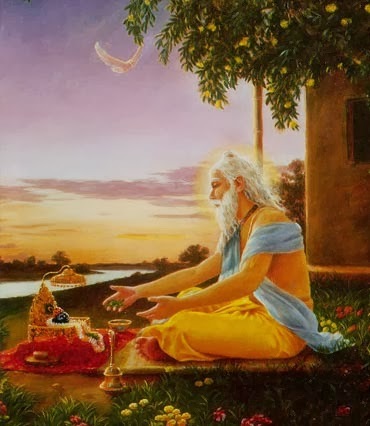 Advaitacharya’s name indicates that He is nondifferent (advaita) from Lord Hari (Krishna), and He is called acharya (spiritual master) because He taught bhakti. To read more about Advaitacharya click HERE! We warmly accept any donations (via PayPal) to help support the wonderful activities, festivals and events at ISKCON Toronto. quotes by Srila Prabhupada. Email Us to Join! Access Code: 4504210 Email Us for More Info! Copyright © 2013 The Toronto Hare Krishna Temple!. All rights reserved.